[C]ontrary to their stated aims, undermining hard-won IP protections for pharmaceutical innovators won’t lower drug prices or encourage innovation. Quite the contrary, their agenda would only raise prices and suffocate innovation. Among the Trump Administration’s most important but underappreciated achievements is the way it managed to strengthen American intellectual property (IP) protections while renegotiating the 25-year-old North American Free Trade Agreement (NAFTA) into the new United States-Mexico-Canada Free Trade Agreement (USMCA) last year. That includes provisions protecting the vital U.S. pharmaceutical sector, which accounts for an astonishing two-thirds of all new drugs introduced in the world, and off of which other nations have freeloaded for far too long. The USMCA strengthens protection for pharmaceutical innovators by bringing IP protections closer to existing U.S. standards, including 10 years of protection for biologic drugs and an expansion of the scope of products eligible for protection. A coalition of left-wing special interests and labor union leaders, however, seeks to undermine those strengthened IP protections by working to advance their agenda in the new Nancy Pelosi-led House of Representatives. According to them, protections for American IP rights in trade agreements should be weaker, not stronger. But contrary to their stated aims, undermining hard-won IP protections for pharmaceutical innovators won’t lower drug prices or encourage innovation. Quite the contrary, their agenda would only raise prices and suffocate innovation. To understand why, it’s important to understand the role that IP plays in spurring innovation, including lifesaving pharmaceuticals. For over two centuries, America’s tradition of protecting IP rights – patents, copyrights, trademarks and trade secrets – has remained perhaps our greatest competitive economic advantage over the rest of the world. In the Federalist Papers, James Madison emphasized that, "The public good fully coincides in both cases with the claims of individuals," and patent attorney Abraham Lincoln later affirmed, "The patent system added the fuel of interest to the fire of genius in the discovery and production of new and useful things." Through ensuing decades and centuries, America has continued to stand atop the world in the extent to which it protects IP rights. Year after year, the U.S. ranks first in global IP protection surveys. As a result, no nation in human history even approaches our record of scientific, artistic and commercial achievement. No reasonable person can refute that causal connection between IP protection and our status as the most prosperous, innovative and powerful nation in history. After all, other nations have possessed superior natural resources and greater populations, but no nation matches our IP protection or our consequent level of innovation. In a progressively information-based global economy, IP sectors also constitute an increasingly critical portion of our economy. Today, according to the U.S. Patent and Trademark Office (USPTO), IP-intensive industries account for approximately 40% of total U.S. annual economic output and 45 million jobs — about 30% of total U.S. employment. Among the most tangible and invaluable fruits of that IP tradition is America’s pharmaceutical industry, which stands completely unrivaled in the world. As noted above, the U.S. accounts for over two-thirds of all new life-saving and life-improving pharmaceuticals introduced in the world, which almost defies belief. Moreover, Americans enjoy the tangible benefits of that pharmaceutical innovation. According to a Wall Street Journal analysis, American consumers enjoyed access to 70 of the 74 new cancer drugs developed between 2011 and 2018, a rate of 95%. By way of comparison, only 74% of U.K. patients, 49% of Japanese patients and 8% of Greek patients could access those new drugs. American patients can typically obtain new drugs immediately upon approval, whereas other industrialized nations impose months or even years of delay as a consequence of their policies. To its immense credit, the Trump Administration improved NAFTA’s IP protections, including those pertaining to pharmaceuticals, in crafting the USMCA accord to preserve our global leadership status. Unlike NAFTA’s weaker protections, the USMCA requires Canada and Mexico to observe 10 years of patent protection for test data used in creating biologic medicines, which increasingly target deadly diseases like cancer and heart disease. It must be noted that the USMCA’s 10 years of protection still doesn’t match the 12 years of protection under domestic U.S. law, but it’s a dramatic improvement over NAFTA’s terms or the 5 to 8 years that the Obama Administration had negotiated in trade agreements. But the opposite is true. It costs billions of dollars and years of trial to develop and bring a new lifesaving drug to market. Accordingly, if the window of patent protection during which developers can recover their costs is narrowed in the manner the naysayers advocate, that will by necessity raise prices rather than reduce them. The obvious answer is that it will not. 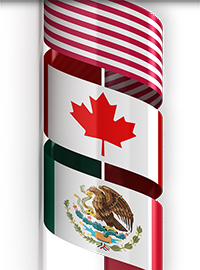 The USMCA expands IP protections for all participating nations, bringing them closer to U.S. standards rather than lowering U.S. standards toward their levels. That constitutes a welcome change and immense achievement by the Trump Administration, one that we must preserve, not suddenly and pointlessly surrender.